Flynn is teething. 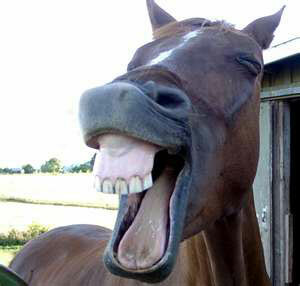 Horses, like humans, possess “baby” teeth and adult teeth. From around the age of one onwards, they begin the process of losing their baby teeth and getting their adult teeth. This will continue until about the age of five, when their last permanent teeth (for males horses at least, as only some females get these last teeth) – their canine teeth – erupt. Flynn last visited the horse dentist (yes, such a person exists) in July this year. At the time, he was yet to show any signs of his canine teeth coming through. But, a few weeks ago as he stood in front of me and yawned a massive horsey yawn, I noticed two little canine teeth poking through on his bottom jaw. I found this interesting, as in the weeks before this discovery, Flynn had developed a disconcerting habit of tossing his head. As I do, I had considered the various possibilities of why he might be doing this, and on seeing his latest dental developments, wondered if it was simply because his mouth was hurting. The head tossing, now accompanied by occasional nipping and grumpy moments has continued – and so yesterday, Monday, as he stood before me asking for a scratch, I slid my thump into his mouth and found two hard lumps on his top jaw – just where the top canines will poke through. For some unknown reason, I rubbed this area with my thumb and found that my grumpy little horse stood, with his head down, eyes closed, enjoying the sensation! As I stood in the middle of the horse paddock, I reflected on how much my life has changed. For many years, I worked in a comfortable office, caught up in a seemingly never ending cycle of meetings, deadlines, visions statements and the pressure to ensure that everything I was responsible for was bigger and better than what it was yesterday. Now please don’t get me wrong – there is a time and place for those things – but sadly, as is so often the case when surrounded by never ending demands, the truly important things can be easily forgotten. So caught up in making things work, we forget why we are doing those things in the first place. And so, a couple of years later, I find myself standing in a horse paddock on a Monday morning. The wind is fresh and cold, the sky is overcast and it is drizzling. The warm comfortable office is a memory and I have my hand inside a horse’s mouth. There would be those who would suggest I have sold myself short – run away from what I am “called” to do – yet, the satisfaction I feel at bringing relief to a small horse with a sore mouth – is simply irreplaceable.